Lockheed Martin has concluded a closed loop satellite tracking demonstration of a scaled version of the Long Range Discrimination Radar using tactical software, production hardware and backend processing equipment. The test is one of the technical milestones in the LRDR program needed to facilitate the delivery of the radar platform to the Missile Defense Agency in 2020, Lockheed said Tuesday. The company built and designed a Solid State Radar Integration Site in Moorestown, N.J., as a scaled LRDR platform in an effort to mitigate risks and facilitate on-time delivery of the radar system to MDA. Lockheed will continue to use the site to advance development work on SSR. LRDR is designed to serve as a sensor system and collect discrimination, acquisition and tracking data to help MDA protect the U.S. from ballistic missile threats. 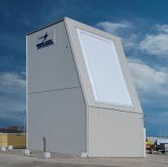 “Demonstrations executed to date prove that Lockheed Martin has designed a solid state radar system that is on schedule to deliver on time and is on track to achieve its mission to defend the homeland,” said Chandra Marshall, LRDR program director at Lockheed. Lockheed completed the critical design review of LRDR in 2017 and kicked off construction work on the system in September in Alaska with plans to begin full-rate manufacturing in 2019. The company works on the LRDR program under a potential nine-year, $784M contract awarded in 2015.